Scott Hiller is hoping to tune customers in to a new way to buy home theater systems. Hiller opened Denver Media Designs last month in the Denver Design Community complex on South Broadway. 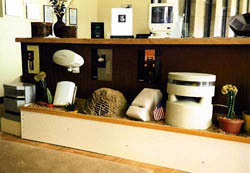 The 1,500-square-foot store contains five complete media rooms with different equipment for different effects. For example, one media room has all the equipment, speakers and 61-inch television framed into a false wall, so there are no unsightly wires and cables. 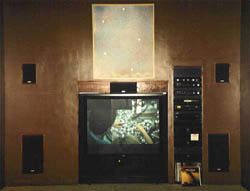 In another room, which Hiller calls the "invisible room," the speakers are painted into the walls and ceiling; the equipment is in another part of the store and the television in an armoire. "The idea is not to show as much as possible," Hiller said, "but to show what makes the most sense." Denver Media Designs fits in well with the other showrooms in the complex because it shows customers the possibilities and emphasizes how the system will fit into the customer's home, Hiller said. Many customers may want to visit the store with their interior designer, but the store is open to everyone. Having a custom home theater system is what many consumers really want, said Sandee Thieme, owner of Sandee's, a home furnishings store in the Denver Design Center. "People who use a designer and use the Design Center are looking for something no one else has and Scott can offer that," she said. "And many people like smaller, cozier shops where you feel like people are listening to you. Listening to his customers is what Hiller said his store is all about. He began his career in the consumer electronics industry at age 17, selling VCRs while working at New York Video when he was in high school in New York. He also gained much of his experience in the industry while working in international marketing for U.S. JVC Corporation in Elmwood Park, New Jersey. Hiller knew he wanted to open his own home theater store, looked at various markets and settled on Denver because of its growth and the minimal competititon, he said. Another reason was the University of Denver, where Hiller earned a master's degree in international marketing. He started the company a year ago. Most of the company's work during its first year has been commercial, including a contract with Rock Bottom Restaurants to install televisions in many of the chain's Old Chicago restaurants, but with the opening of the space in the Design Center complex, Hiller hopes to move more into private sales to individuals. Customers should not be pressured into buying what they can't afford or what they don't want, Hiller said. "Whether a customer is spending $3,000 or $30,000, there are some great products," he said. "In a huge electronics stores, too much control is taken away from [the customer]." For that reason, Hiller said, he rarely talks about brands even though he has sold almost all of them during his 16 years in consumer electronics sales. Speakers, for example, come in all sizes and range in price from hundreds to thousands of dollars, Hiller said, but he would never discourage a customer from buying a brand that he or she really wanted. "There is truly no such thing as a bad speaker because it's your ear," he said. "While I could explain reasons why some are considered better, when it gets down to it, ultimately it's what the customer prefers."